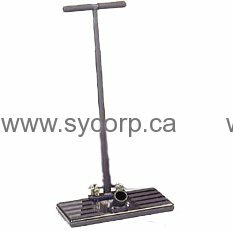 The Water Claw has introduced to the carpet maintenance industry a tool specially designed to extract water out of BOTH carpet and pad from the surface! Designed for quick and easy flood extraction in preparation to the final drying process. The Water Claw's speed, performance and profitability in doing most flood jobs WITHOUT removing carpet and pad has been proven in thousands of flood restorations worldwide. In addition, the Water Claw Flood Extractor can be used to quickly evacuate black water floods allowing you to more easily remove and carry out carpet and pad. Specially designed bottom plate maximizes suction and water channeling into vacuum chamber. The extraction plate grid and vacuum manifold have been scientifically designed to multiply and enhance your sub-surface flood lifting capabilities in the same way a pulley system multiplies and increases weight lifting ability. Medium Model Dimensions - 10" × 17"
½" thick clear acrylic top plate for viewing extraction results. Vacuum release to prevent suction lock-down when stronger vacuum systems are used. Angled metal vacuum flange helps keep hose out of the way and accepts 1½" or 2" hose cuffs. Upright handle adjusts to variable heights and detaches for easy storage. All metal parts are stainless steel, zinc coated, or powder coated. Polymer materials are impervious to water. Clear acrylic top plate is highly resistant to chemical damage.